I know it has been quite a while–a new shift schedule has wreaked havoc on my free time, making blogging hard. But stay tuned. I’m on vacation and I’ve got ideas. This post is inspired by our trip to Vermont, home of King Arthur flour, and Maine, where I had a yummy taste of a locavore Parsnip Oat bread (will be trying to recreate)–if you are ever in Portland try Vinland–99% locavore, organic and most importantly creative and tasty. This is an updated and modified version of the King Arthur Vermont Maple Oatmeal bread recipe I’ve made several times. Today’s modifications yielded a loaf that is moister, has less sugar, and is more multi-grain than either the original or my previous versions. The first modification was to add a banana and subtract the maple syrup. I ended up adding back about a tablespoon of honey because my banana wasn’t super ripe. I also substituted 1/2 cup rye flour and 1/2 cup oat flour plus 2 T of vital wheat gluten for 1 cup of all purpose flour, and added about 3T of milk (some recipes say to add 1/4 c of extra liquid when you replace AP for whole grain flours, but you have to do so slowly, or let it sit and absorb the liquid for about 30 mins before kneading). My loaf is still not rising as much as I’d like–most likely because the whole grains are heavier, but the addition of the vital wheat gluten was helpful. I might try King arthur’s “dough improver” as well next time. Lastly, I rubbed the whole thing down with a dab of olive oil. The ingredients may seem crazy long but two thoughts: you probably have most of these in your pantry and if not substitute! in a stand mixer, mash the banana. Add hot water, rolled oats, olive oil, cinnamon and stir on low to combine. Let stand for 10 mins. Add the remaining ingredients and knead with dough hook, roughly 7 minutes on speed 2 and 3. That kneading time really helps with the rise. Rub dough with olive oil. As in the original instructions, cover (I put it into a ziploc or wrap it in plastic wrap, then put it back in the mixer bowl, and cover the whole thing with a towel) and let rise for 60-90 mins. I actually let it sit for 2 hrs once and almost 6 another time. The dough is supposed to double in bulk and be spongy and springy. I found longer wait times help achieve this plus allow more flavor to develop. You could let it sit while you are at work. If you don’t have time consider dough improved. Bake for a 35-45 minutes–test the product with a thermometer. Internal temp should hit 190. (I think mine baked for 45-50 mins). 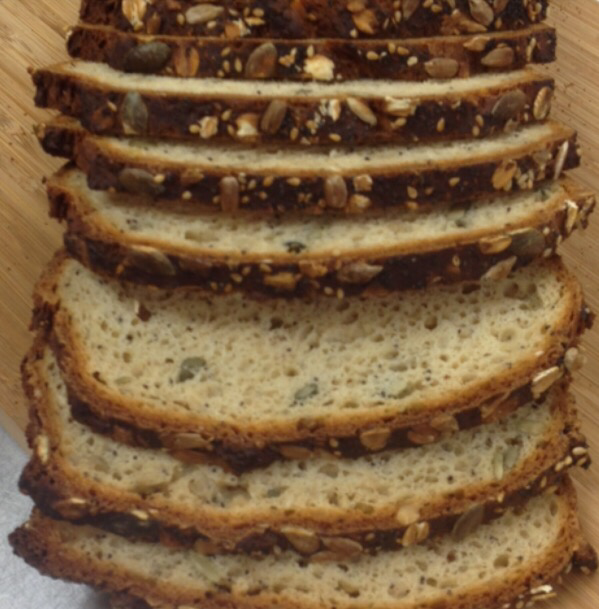 This entry was posted in Recipes, vegan, vegetarian and tagged bread, breadmaking, d, multigrain, seeded. Bookmark the permalink.